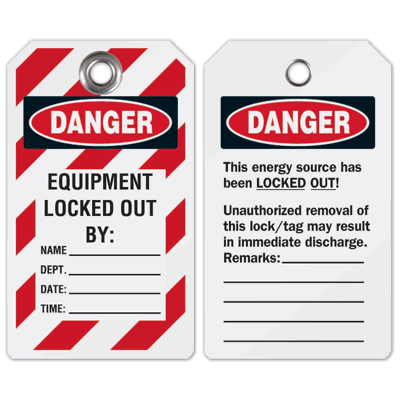 Front of Tag reads "Danger Equipment Locked Out By"
Back of Tag reads: "This energy source has been LOCKED-OUT! Unauthorized removal of this lock/tag may result in immediate discharge. Remarks:"
THIS ENERGY SOURCE HAS BEEN LOCKED OUT! UNAUTHORIZED REMOVAL THIS LOCK/TAG MAY RESULT IN IMMEDIATE DISCHARGE. REMARKS_____.